How much is Donny Deutsch Worth? 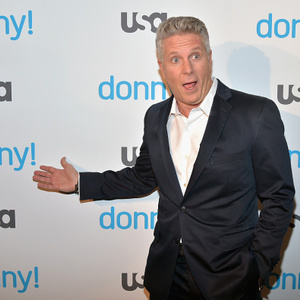 Donny Deutsch net worth: Donny Deutsch is an American advertising executive and television personality who has a net worth of $200 million dollars. Donald Jay Deutsch was born in Hollis Hills, New York in November 1957. His father founded David Deutsch Associates in 1969. Donny attended the Wharton School of the University of Pennsylvania. He joined his father's advertising firm in 1983. His father David handed over full control of the company to Donny and he became chairman at 1989. Donny then renamed the company to Deutsch Inc. In 2000 Donny sold the company to Interpublic Group of Companies for $265 million. From 2004 to 2008 Donny was the host of CNBC's The Big Idea with Donny Deutsch. He has also been a regular guest on Morning Joe on MSNBC and frequently appears on the Today Show. In 2013 he had a new CNN show called (Get to) The Point, which was cancelled after only one week. He has also published books in 2005 and 2008. He was previously married to Stacy Josloff and has a daughter Daisy with his former girlfriend Amanda Zacharia. He has purchased a property in New York City for $21 million and a home in East Hampton Village, NY for $29 million. In 2013 he declared himself a member of the Democratic Party and has also declared himself a feminist.